Mary Ainsworth (1970) carried out most of her research in the USA, but child rearing practices vary considerably from place to place in terms of environment, traditions and beliefs about children. Individualist cultures value independence with each working to their own individual goals e.g. USA and Europe (Western Cultures). Collectivist cultures value cooperation with each working towards the family or group goals e.g. Japan and Israel (Eastern Cultures). To investigate the types of attachment across cultures and to see how the three main attachment styles applied. To investigate if attachment styles (secure and insecure) are universal (the same) across cultures, or culturally specific (vary considerably from place to place, due to traditions, the social environment, or beliefs about children). Van Ijzendoorn & Kroonenberg (1988) did not collect the data for this study, instead they analyzed data from other studies using a method called meta analysis. Data from 32 studies in 8 different countries was analyzed. All the 32 studies used the strange situation procedure to study attachment. Using a meta analysis (statistical technique) they calculated the average percentage for the different attachment styles (e.g. 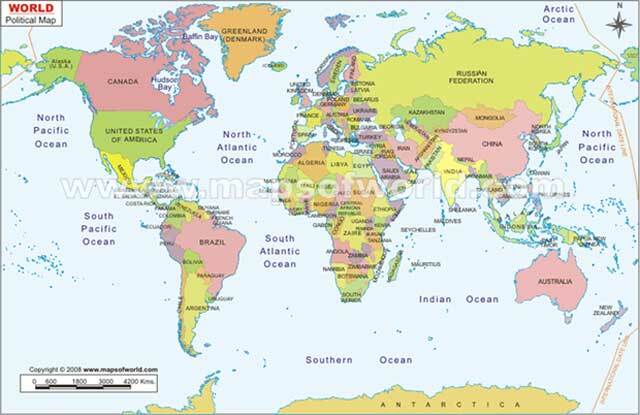 secure, avoidant, resistant) in each country. It was found that secure attachment was the most common type of attachment in all cultures. 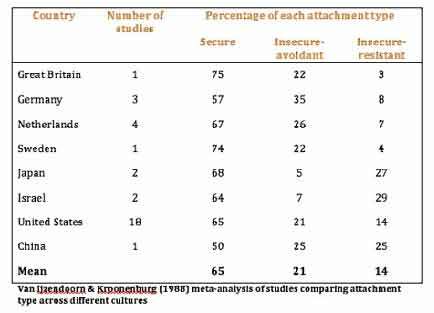 The lowest percentage of secure attachments was shown in China, and the highest in Great Britain. Results showed that individualistic countries that support independence such as Germany had high levels of anxious avoidant, whereas countries that are more culturally close (collectivist), such as Japan, had quite high levels of ambivalent resistant. The overall consistency in secure attachment types leads to the conclusion that there may be universal (innate) characteristics that underpin infant and caregiver interactions. However, the significant variations of insecure attachments demonstrate that universality is limited. Implications include the linking of the variation in attachment to child-rearing practices and environmental factors. Israeli children were reared in a Kibbutz (communal living) so were used to being separated from their mother. As a result they do not show anxiety when their mother leaves. However, they are not used to strangers so get distressed when left alone with the stranger. This explains the high percentage of resistant behavior. The Strange Situation test assumes that behavior has the same meaning in all cultures, when in fact cultural perception and understanding of behavior differ greatly. The Strange Situation was created and tested in the USA, which means that it may be culturally biased (ethnocentric), as it will reflect the norms and values of American culture. For example, the belief that attachment is related to anxiety on separation. This may not be the case in other cultures, e.g. Japan. Many studies have biased samples which cannot claim to be representative of each culture, e.g. 36 infants in the Chinese study. Also most of the studies analyzed where from Western cultures. Van Ijzendoorn and Kroonenberg report that differences in attachment within a culture are far greater than those found between cultures. They conclude that it is wrong to think of everyone in a culture having the same practices. Within a culture there are many sub-cultures, all with their own way of rearing children. One of the German samples was as different from another German sample as it was different from an Israeli kibbutzim or from a US sample. One of the Japanese samples was more similar to two of the US samples than to the other Japanese sample. The Israeli city sample was more like the US than it was to the Israeli kibbutzim sample. Ainsworth, M. D. S., & Bell, S. M. (1970). Attachment, exploration, and separation: Illustrated by the behavior of one-year-olds in a strange situation. Child development, 49-67. Grossmann, K., Grossmann, K. E., Spangler, G., Suess, G., & Unzner, L. (1985). Maternal sensitivity and newborns' orientation responses as related to quality of attachment in northern Germany. Monographs of the Society for Research in Child Development, 233-256. Van Ijzendoorn, M. H., & Kroonenberg, P. M. (1988). Cross-cultural patterns of attachment: A meta-analysis of the strange situation. Child Development, 147-156.